Hello everyone hope you are well. Today lemme talk about this Indian brand called FOREST ESSENTIALS. Forest Essentials is an authentic, traditional Indian Skin Care Brand, with its foundations in the ancient science of Ayurveda. A pioneer in the Luxury Ayurvedic segment, today it has become the quintessential Indian Beauty Brand where secrets of ancient beauty rituals for skin and hair care have been brought to life through in-depth research and made available to modern day customers. Forest Essentials cater to four major categories i.e. Facial Care, Body Care, Hair Care and Wellness category. Each handmade product uses traditional methods in its making and adheres to the highest standards of purity, authenticity and quality. Forest Essentials extracts the best from nature’s vast repertoire and recreates fresh seasonal formulations using organic cold pressed oils, rare plant extracts, herb infusions and steam-distilled pure essential oils. There is a perfect fusion between ancient recipes and modern technology to create a whole new experience — Elegant, Luxurious Ayurveda. Okay, that's enough talk about the brand. Now lemme share my experiences with them. I love all their products especially their oils as they are organic. Their Velvet Silk Body Cream is the best and the Ultra-rich body lotion is just amazing. I could survive on their products my whole life. They are pure luxe. In fact my whole family loves their products. They make perfect gifts too. If you are into natural products they are for you as long as you don't mind strong fragrance. Happy pampering y'all. The packaging on these is so gorgeous. The velvet silk body cream sounds amazing! These products looks great and the packaging is so pretty! Beautiful review, TFS! Wishing you a happy and healthy New Year!!! Wow, these products are beautiful! Looks like great products and the packaging is awesome. Happy New Year dear! Oh wow, what a beautiful gift set! The packaging alone is beautifully elegant and luxurious - I can imagine how lovely they must smell! The Ultra-rich body lotion sounds so appealing right now for dry winter skin :) Happy 2017! These products look really gorgeous! Happy New Year, beautiful; I hope you're off to a great start to 2017! This brand sounds wonderful, I love that they're organic (which is all I use for my skincare) and the packaging is so beautiful! I've never heard of this brand before, so I appreciate you introducing me to it, I'll have to keep it in mind. Have a wonderful week ahead, beauty! How gorgeous are these products! I love learning about Indian skincare brands. Indians love their oil based beauty products. And the packaging on them is just simply beautiful. This sounds like an amazing brand! I always love finding new skincare product. And that packaging is so cute! I don't think I've ever seen such beautiful packaging in my life! I've never heard of the brand before but by goodness, they are stunning! I would love to try it out, seeing as they are handmade. The packaging is very beautiful! 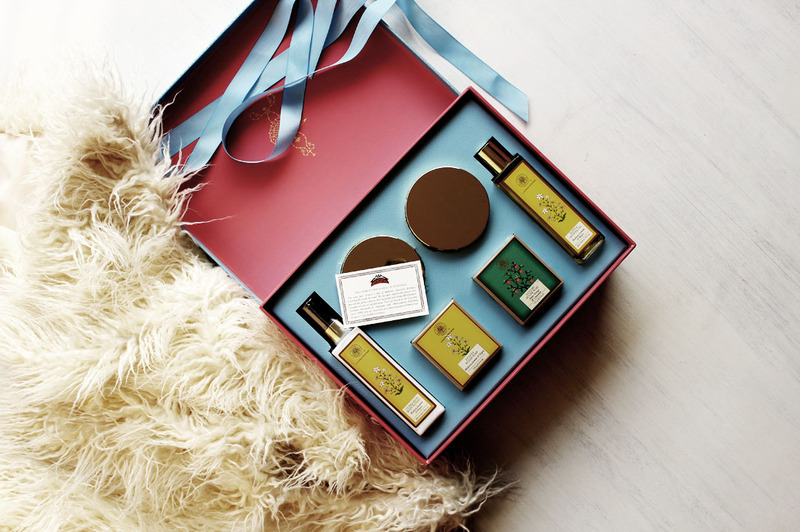 Beauty packaging! Is this brand cruelty free? never tried indian skincare before. this looks interesting! Love these products! Need to check them out! I'm obsessed with the packaging! It looks amazing.